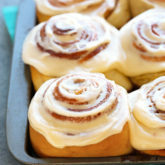 Cinnamon roll lovers rejoice! 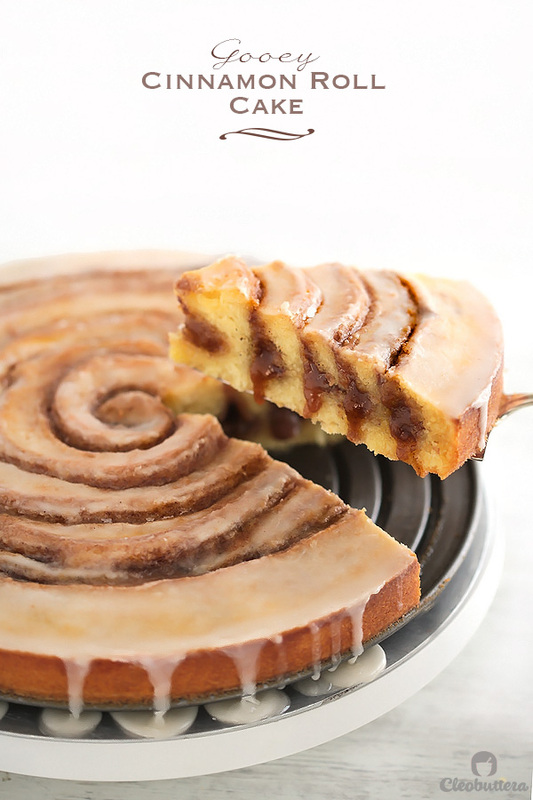 This warm glazed vanilla cake oozing with pockets of gooey cinnamon swirls has your back. 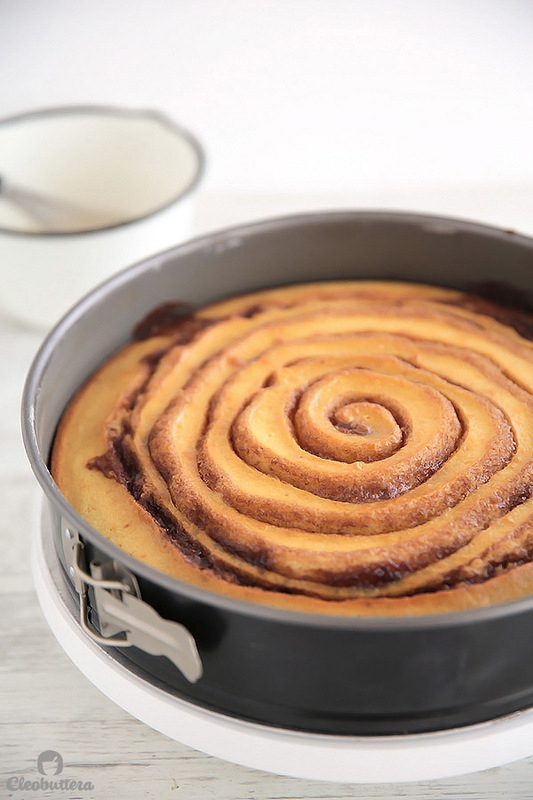 It is reminiscent of a cinnamon roll, but prepared in a fraction of the time and effort. Plus…recipe VIDEO! I cannot even count the number of times that I’ve made this cake. It is, hands down, a family favorite and one of my most requested things to bake. 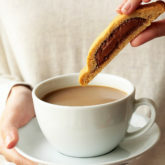 It’s one of those things that after you finish eating your share (and lick the plate), you find yourself standing beside the serving platter, fork in hand, and sneaking in bite after bite until the symptoms of a sugar coma start to kick in. Usually a partner in crime is involved. One problem with the way I’ve always made it though, is that it was so Ooooooglayyyyy! Baked in a rectangular pan with irregular brown tunnels and holes, it definitely wasn’t a looker. Delicious YES, pretty NO. If it weren’t for its mesmerising smell, I don’t think anyone would be willing to try it. I patted myself with all that “its not what is outside but what is inside that counts,” “beauty comes from within,” “never judge a book by its cover,” and every other self-esteem boosting anecdote our mothers told us as pimply teenagers. But then when my brother, who’s actually obsessed with this cake, calls it “Worm Grave Cake,” I decided it was time for a facelift. This cake deserved to look as good as it tasted and it wouldn’t hurt if it looked like an actual cinnamon roll. So when I stumbled across The Baker Chick’s pumpkin cinnamon roll cake with all her swirling and twirling action, I knew that that is the way to go. And now my beloved cinnamon roll cake not only tastes like a cinnamon roll, but looks like one too! So what’s that deal with this insanely good cake? You see those pockets of gooey gloriousness oozing out of it? Yeaaaaah…that’s the deal with this cake. I call this “The Goo.” But I think “The Magic” would’ve been a better fit. 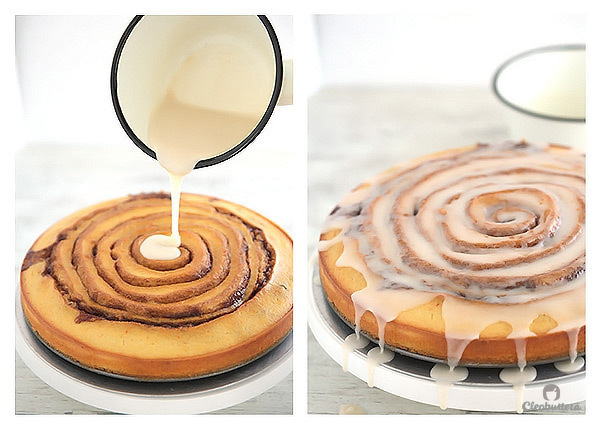 This is what makes the cinnamon roll cake, taste like a cinnamon roll. It’s also responsible for the “gooey” in the title. It tastes exactly like the filling of a real cinnamon roll and gives the cake that irresistible gooey texture of a the roll’s center. Also that glaze…Mmmmm…you can’t have a cinnamon roll without a glaze right? Its just against the law. Unlike cinnamon rolls, this cake takes no time to make and is so easy. No yeast, no rising, no fancy mixers, no creaming of butter and sugar. 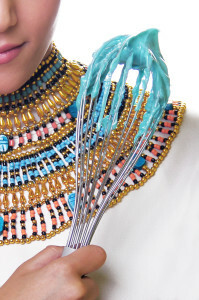 It’s all done by hand with the help of a good ol’ whisk and maybe a spatula. Here’s a video of how it all comes together! Now let’s dive into the details! You first start by making the “Goo,” aka “The Magic,’ by combining together ingredients that just can’t go wrong; butter, brown sugar, cinnamon and flour. Done! Now on to the cake, which comes together so easily by whisking together the usual cake suspects: flour, sugar, baking powder, salt, eggs, milk, vanilla and melted butter. Then it gets poured in a buttered and floured pan. I prefer springform for its ease of release. What is it with me and rhyming these days?! Then you get your glorious “Goo” with a capital G and pipe in a circular motion, starting from the center and going round and round towards the sides of the pan. Then you bake that beauty and keep peaking inside the oven to make sure that the swirls are still there. And yes indeed they are! 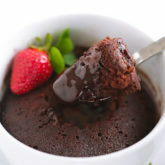 Towards the end of baking make a simple glaze by whisking together powdered sugar, vanilla and some milk. That’s it! Then while the cake is still hot, pour it all over. 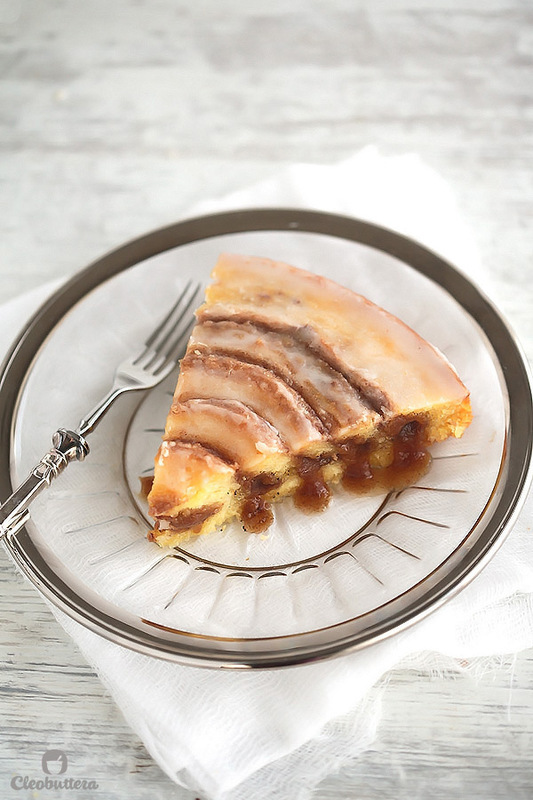 The glaze will soak in a little and after it sets, it will give a slight crackly texture to the top of the cake. Kinda like a donut. Oh yeah! Now try to resist and wait at least ten minutes so you don’t burn your tongue and to give the glaze a chance to set. Now go ahead…cut yourself a small piece or BIG, close your eyes and enjoy. Aaaawwwww…My ugly duckling not ugly anymore. I loved you regardless though. Several readers have been having issues with this recipe. For that reason I’ve decided to change its name from”Easy” Gooey Cinnamon Roll Cake to just ‘Gooey Cinnamon Roll Cake,’ because if it poses a challenge to some, then apparently its not as easy as it seems, and therefore should not be a part of the title. With that said, I’m still up to my claim that this is one incredibly delicious cake when made right. I’ve been making it for years and people just go nuts over it. I’d really love for you to achieve the same successful results and so I decided that it would helpful to add a troubleshooting section, to help you avoid any of the problems that others were faced with. So please read before proceeding with the recipe. Pan size: The size of the pan is critical to the success of this cake. It should be an 11 inch/28cm round pan. Any smaller than that and the cake will rise too much and the goo will sink into the batter, erasing all of these beautiful swirly details akin of a cinnamon roll. If you don’t have this pan size then I’d recommend opting for the 9X13 baking pan method. Also make sure that if you use a springform pan, that its leakproof. Some kinds tend to leak, and if that happens, you’ll lose all your goo in the baking process and make a huge mess in the oven. Softened butter for the goo NOT melted: Make sure the butter called in for the goo is softened to room temperature and NOT melted. Using melted butter will cause the goo to float up on top of the cake, making one greasy, overly sweet mess. The cake will be swimming in melted butter and you don’t want that by any means. Soft brown sugar: Make sure that the brown sugar you use for the goo is the soft kind that feels like wet sand. Using the other coarse kind of brown sugar like the demerara kind, will cause the goo to be coarse in texture and will not dissolve into the butter. The texture will just be off. Brands I love using are Dominos and Red Path from when I used to live in Canada. Use the entire amount of goo: Don’t be afraid to use all of it. If you don’t, the cake won’t be as gooey and might end up of the dry side. Piping tip size: Make sure that your piping tip or opening of your zipper lock bag is not larger than 1/2inch or 1 1/2cm in diameter. If your piping is too thick, the goo will be too heavy for the batter to hold up and will be more prone to sink, again losing all the swirly details. 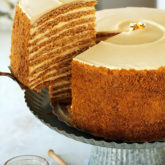 Consider the 9X13 baking pan method: If you’re looking for an easier, fuss-free method to make this cake that does not require meticulous piping or don’t have the correct round pan size, then I highly recommend foregoing the round pan and use a 9X13inch baking pan like a pyrex instead. I have detailed instructions of doing that in the ‘Notes’ section of the recipe. Basically you pour the batter in a rectangular pan, drop random spoonfuls of the goo right on top of the cake batter, give it a few swirls with a knife or skewer and that’s it. You don’t even need to unmold the cake from the pan because its served right from it. Testing for doness: Start checking for the doneness of the cake after 25 minutes. Gently press with your finger in the center, if it still feels very soft, then give it another 5 minutes, then another 5 if needed. I never had to bake it for more than 35 minutes but oven temperatures vary. When lightly pressed with your finger, it should spring back and feel firm. Insert a toothpick in a cake-only area in the center, where you can’t see any brown goo. Remember that the goo is very soft and liquidy and so if you insert the toothpick in it, it will seem raw even if the cake is done. The toothpick should come out clean with a few cooked crumbs attached. Undercooking will result is a semi-raw cake and overcooking will result in a dried out goo that won’t ooze out. 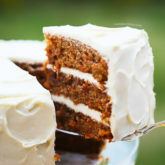 Halving the recipe: If you don’t need that much cake hanging around, you could easily halve this recipe. I do it all the time when we’re having a small company. 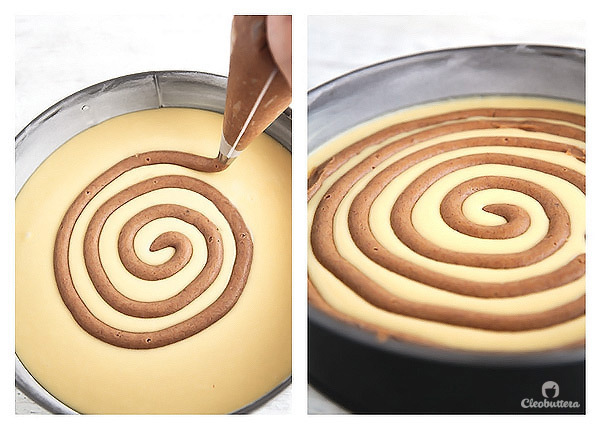 Use an 8inch cake pan for the round method with the piped swirls, or an 8inch square baking pan for the dolloping the goo method. Keep in mind that it will bake in less time, so start checking after 20 minutes. I sincerely hope that this helps you achieve the same bonkers awesome results that myself and others had. If you have any other issues that I have not covered and wish to be addressed, please leave in the comments below, so I could add it to the troubleshooting section. Please read the troubleshooting section above before proceeding with the recipe for tips to guarantee success with this cake. In a medium bowl combine together the 1 cup butter, brown sugar, flour and cinnamon until well blended. Transfer to a piping bag fitted with a round tip (I use a 1/2 inch/1 1/2 cm diameter) or a zipper lock bag snipped in one corner. Set aside. Spray or butter and flour an 11-inch round pan (preferably springform). In a medium bowl, whisk together the flour, granulated sugar, baking powder and salt. Set aside. In a large liquid measuring cup or small bowl, whisk together the milk, eggs and vanilla. Pour the milk mixture into the flour mixture and whisk just until combined. Lumps will remain. Slowly drizzle in the melted butter to the batter while mixing. The batter should now be smooth but a few lumps are OK.
Pour the cake batter into the prepared pan, then starting in the center pipe the "Goo" in a circular motion going around and around towards the sides of the pan until the goo is all finished. Bake for 30-35 minutes or until a toothpick inserted in the center of the cake comes out clean. Do not insert the toothpick in the 'Goo" area, because that is supposed to be gooey anyway. Remove the removal rim of the pan, if using the springform pan, and transfer to a serving platter. Or leave it in the pan if using a regular one (without a removable rim). Drizzle the glaze all over the cake, then leave it to cool for about 10 minutes before serving. This cake tastes best when served warm out of the oven when the "Goo" is still melty, but cooled portions of the cake can be warmed in the microwave. Store leftovers in a airtight container. 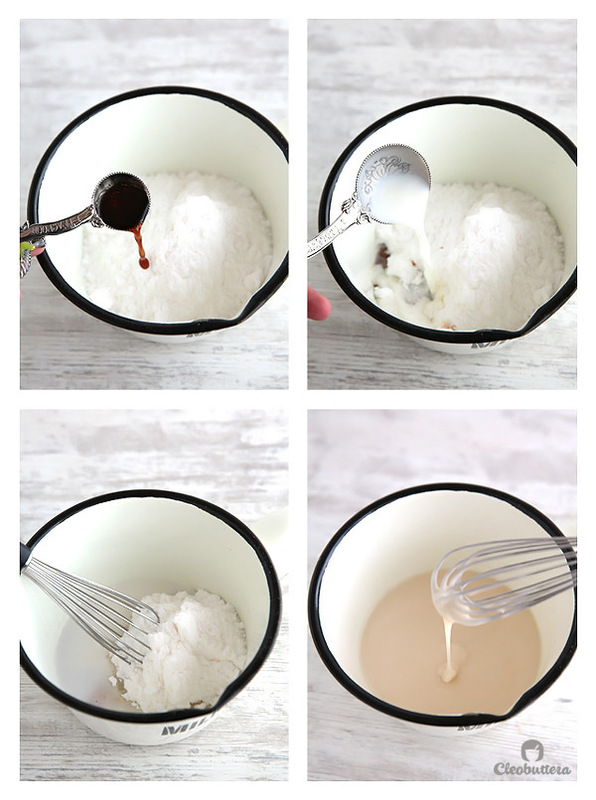 In a small bowl, whisk together the powdered sugar, milk and vanilla until smooth. If you don't have a kitchen scale to weigh the flour, use the Spoon & Sweep method: Use a spoon to lightly fill measuring cup with flour until required amount is obtained, then sweep access with the back of a knife. For an even simpler method (ahem...the not so pretty one), this cake could be made in a 9X13 inch baking pan and served right from the pan, thus eliminating the piping of the goo and removing the cake from the pan. 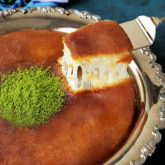 After pouring the batter in the pan, simply dollop spoonfuls of "Goo" all over the pan in a dotting fashion, then using a knife marble and swirl through the cake. Adapted from Picky Palate. 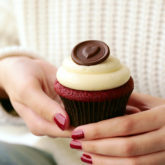 who happened to make hers in cute little cupcakes. Hers were actually very pretty. I can’t wait to try this one! It looks amazing!!!!! Yummm!! You got me with this cake!! Looks so delicious and just perfect for breakfast!! I have never seen a cake like this before! 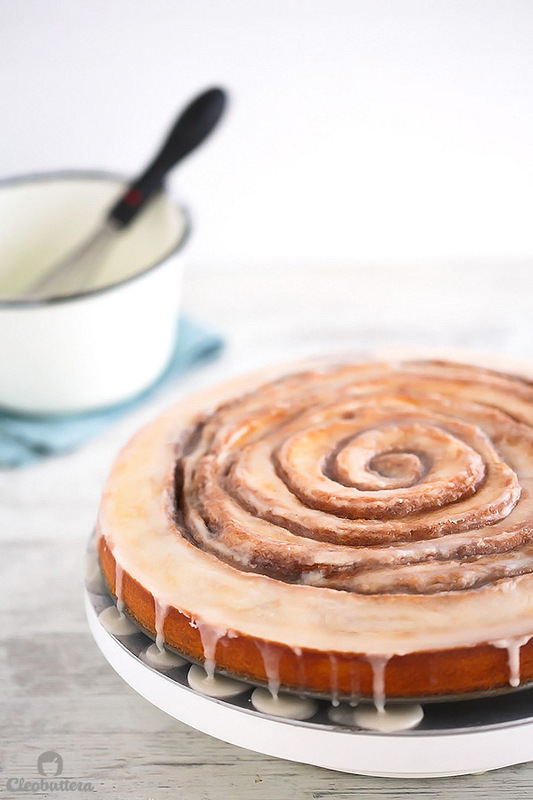 This gooey cinnamon roll cake just looks so delicious… and I bet it tasted even better too! Muchisimas gracias !! yo tambien uso el traductor de google, no te preocupes, en España tenemos azúcar morena, no será luz, pero es azúcar morena, de nuevo ¡¡ muchisimas gracias !! This looks ah-mazing! Pinned and bookmarked because I really need to make this! WOW YUM YUM YUM That looks delish! Pinned! 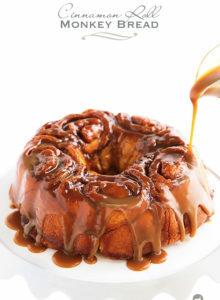 Oh sweet cinnamon gooey yumminess…this looks fantastic! I am making this for a teacher appreciation luncheon tomorrow. My husband was a guinea pig for my first round and loved it. I used a 9 x2 springform pan as I could not find an 11 in. Was delicious, but not as pretty as yours. The “rings” weren’t quite as uniform. Any suggestions? Hi Tam:) I’m so happy you liked it! Ok so actually a few of my friends who tried it had the same problem too, so I got into my mad scientist mode to try and find out what went wrong. Turns out that they too used smaller pans and their piping was so thick. 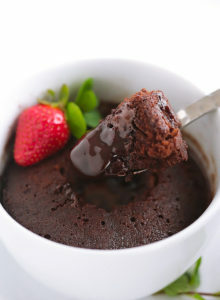 With the goo being so thick and heavy, it tends to sink and disappear within the cake batter, especially if you have a lot of batter in a small pan. So my suggestion to you would be, to first make sure that you use a piping tip or ziplock opening of not more than 1/2inch. This make it light enough so it doesn’t sink. The size of the pan is important too. A 9inch pan will produce a very high cake layer and will cause the goo to sink in. So you could either divide the cake batter on 2 (8inch pans) and if there’re not springform, then make sure you line them with parchment paper so you could easily turn them out. Otherwise they will stick to the pan because of the gooey nature of the cake. Another alternative which I talk in detail about in the ‘notes’ section of the recipe is to use a 9X13 baking pan and serve right from it. This is the way I’ve always made it before. So good but not as pretty. Hope that helps. Found your website from Pinterest… your stuff is GORGEOUS! Just crushing hard over, uhm, everything. So glad to have found you! Of course!! You’ve got something good going. Excited to see what’s in store! This is being made in the very near future, but a question. 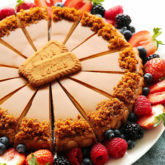 I find many recipes to sweet for my taste so would it affect the recipe too much if I cut the sugar by let’s say twenty five percent in both the goo and the cake? 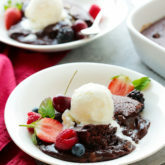 I love dessert but many of the recipes I find online make me fall into sugar overload! First, when I made my “goo”, it wasn’t as smooth as the one in your pics…the sugar doesn’t melt or anything you can still see the granules… I microwaved the mix a bit and whisked at again but it didn’t change…so I piped it anyway and baked the cake. The goo didn’t sink or anything, it just doesn’t ooze out like yours… Also, the icing soaks in so much that the cake turns out EXTREMELY sweet. I think it should be optional and served aside. However, the cake itself is absolutely GORGEOUS. A buttery, fluffy goodness. Loved it. Any suggestions about what do to next time with my goo? Haha. could this be made in advance and reheated? I am thinking for Christmas morning. 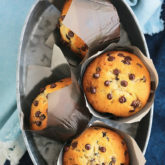 Can I make it and bake it, then reheat in the morning – or will that dry it out? Could I assemble the night before and just bake it the morning of? Any suggestions? 1- the goo – aside from being super delicious -it was a lot, i still have about half the amountbin the fridge! Which will make it easier for me next time i make the cake! 2- the cake itself tasted great, the only thing that i thought was a lot was the baking powder, it made the cake rise A LOT, it was double the photo you posted, which made the cake take around 10 minutes more than the time you mentioned. But at the end, it was such delicious cake that i would definitely bake once again, and my husband is telling you it’s DELICIOUS, now i have to go and gobble some more! Have a good day and thank you. Thanks Mariam for coming back and letting me know how it turned out! I’m so happy you liked the taste. We too love to eat it straight out of the oven; we might’ve had several burnt tongue incidents. Regarding the issues you had, I’m sensing that you might’ve used a smaller pan. If that’s the case, then you’re right, you’ll feel that the goo is too much because the surface area is smaller and so won’t fit all of the goo. Also it will rise more than normal and turn out a lot thicker than pictured. If you don’t have a round pan that is 11 inches, I recommend using the 9X13 baking pan method mentioned in the notes. If you do try it again, please please please use the entire amount of goo, its incredible with the full amount. It will give you a piece of goo with every bite. Unless of course you prefer the goo very subtle, then its definitely up to you. Ok so 23cm is 9 inches and 11 inches is about 28cm so that a difference of 5cm. While I’m sure it still tasted great, that’s the reason behind your cake rising too much and turning out too thick. Try the correct pan size and I promise you’ll see a BIG difference. Also pour all that goo in, you’ll like it even more:) If you don’t have a 28cm round pan, then go with 13X9 inch pyrex, it won’t look as pretty but it will actually be easier in the making and tastes just as delicious. Looks yummy! Just curious how does this work if you do not plan on eating it until the next day? Thanks! what measurement would I use?? Thank you. Okay, so I was eager to try this because cinnamon rolls are a huge staple at this house. I set up the mise en place and checked it twice. Read the recipe several times and got started. Are you certain the recipe is posted correctly? What I ended up with was a greasy, nasty, horrible mess and looked nothing like what you posted. As a matter of fact, it took over an hour to bake it because it was not baking in the center and I have a perfectly calibrated oven. The crumb was greasy and not at all pleasing. The “goo” sat on top of the cake and turned into a rock, even after the initial 30 minutes. I suspected that would happen, but reviewing your steps again, I did it exactly as you did and piped it on top of the cake mixture. It didn’t sink into the cake, it didn’t separate the rings that denotes a cinnamon “roll”. 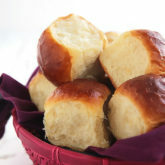 I’m sure there is something amiss in this recipe but would like to try it again with the proper steps and ingredients. Please review and let me know. As a trained pastry chef, the cake recipe seemed a little odd, but thought I would give you the benefit of the doubt and try anyway. Your result was much the same as mine. Thanks to you guys for pointing out your issues, I’ve decided to add a ‘troubleshooting section’ to the post. I’ll do my best to cover all the problems that were mentioned and how to avoid them to ensure success. I am terribly sorry that it didn’t turn out for you. So I checked and checked and checked several times because I’m not gonna lie, your comment really made me doubt that I typed something wrong. I even went back to the original recipe from which I had adapted mine and compared them to each other and still I couldn’t find any mistake. You could check for yourself by clicking the link I attached under the recipe to ‘Picky Palate’ and read her ingredients and instructions too, if you’d like to make sure. The only difference between mine and hers is that I make it in a round pan and pipe the goo in a swirled fashion to make it look like a cinnamon roll. Her method uses a 9X13inch baking pan and dollops the goo on top. I have more detailed instructions for that method too in the ‘Notes’ section after the recipe. Either way it turns out delicious. I’d really really love to help you get it right because its really that good. I have so many friends who made and loved it and want you to be among them. I’m so surprised that the goo sat on top and didn’t sink in. The cake is actually buttery with pockets of goo but not unpleasantly greasy all. I have a friend that had the same problem of having the goo swim on top in a greasy mess and it turns out that she melted the butter called for the goo instead on using softened which makes all the difference. Could it be that you did the same thing too? Also was the brown sugar you used the soft type like Dominos brand? What about your pan size, was it 11inches? I really hope you have better luck with it next time. Maybe you could halve the recipe and make it in an 8inch square pan using the dalloping method to make sure you really like it before committing to a large amount. I do that a lot when I’m having a small company. Please let me know how it goes and throw in as many questions as you need. I’d really really love to help. I used an 11 inch spring form pan as directed and I did not melt the butter for the goo. The recipe said softened, I used softened. The sponge recipe called for melted, I used melted. The chemistry for sponge was way off with the amount of butter used, especially in liquid form. Like Randy, there was too much butter for the recipe and made everything greasy. 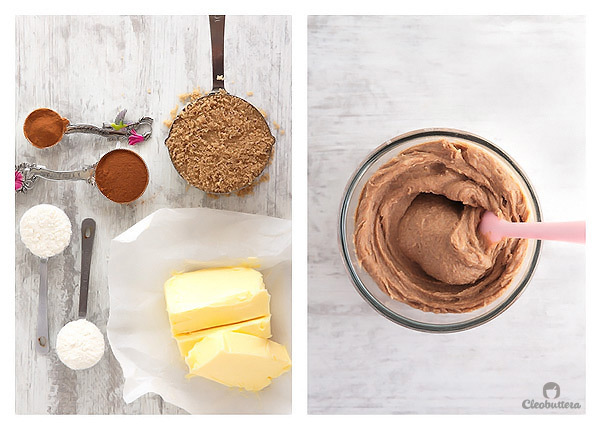 While training as a pastry chef, the first thing they taught us to always use superior products for best results. I always use superior products. Actually the amount of butter used in the sponge itself is half of what is used in most classic vanilla cakes. The popular 1234 cake uses 1 cup of butter per 3 cups of flour, while this one only uses 1/2 cup of butter per 3 cups of flour. The shortage of butter in the sponge is made up in the goo, which yes seems a little excessive but its what moistens the sponge and what makes the goo gooey. The cake is undoubtedly buttery but again we’ve never found it greasy but that could be a relative thing. I hope you check out the troubleshooting section I added in response to your comment. Well, I just finished cooking this cake and I have a few issues with it. My finished cake looked nothing like the picture. I followed the directions exactly and my cake before cooking looked exactly like your pictures. While cooking the butter literally ran out of my cake and onto a pan placed below the cake. My finished cake resembled more of a white cake with a lump of cinnamon dough in the middle. I won’t be making this cake again. Agreed. I was hoping there was a mistake in the recipe, but there is a no logic to the crumb and cinnamon mixture. I hoped it would work, but I think I knew it wouldn’t…. So sad that it didn’t turn out well for you. I’ve been making this recipe for years and its has always a hit. However since you, among other readers have been having issues with it, I think it might be helpful to add a troubleshooting section in the post. I’ll try to cover all the problems that have been faced and how to avoid them. In your specific case, and by your description of how the butter ran onto the other pan, it looks like your springform pan leaked and thus did not contain the goo in. I totally understand why you wouldn’t want to make this cake again, but if you ever decide to give it another chance, I’d recommend trying the easier method which uses a 9X13 baking pan like a pyrex and dollop the goo onto the batter. That way ensures that the goo won’t be going anywhere and no piping is involved, so you shouldn’t expect it to look like a cinnamon roll but the taste is amazing. I’ve always been doing it that way until I decided that I needed it to look prettier because I like a good presentation. Sadly, its not working for everyone:( But then again its the taste is what matters. Sounds yummy!! Do you have to use Whole Milk?? We’re waaaaaayyyy out in the country (it’s 75 miles to the nearest grocery store) & use non-fat dry milk for our milk…. we’re very sporadic with milk usage so I tend not to buy fresh milk as it typically goes bad before we use it all (we’re hard pressed to use a quart every 2 weeks)… Do you think that will work? This sounds and looks yummy mummy! Both darling hubby and I live cinnamon rolls. I’m going to cut the recipe in half and make it in an 8×8 pan. I don’t think I’ll have any issues with The Too… To me, the recipe is pretty straight forward and simple enough to follow. Thanks for sharing the recipe. I’ll post more after I bake and we eat some. 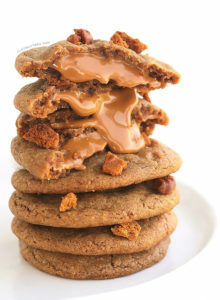 Looks delicious, but i want to know where can i find Dominos brown sugar? Thanks Lobna:) I usually find it at Carrefour, Seoudi (Tagamo3 or Helio), Royal House & Ahmed Abdallah (In Heliopolis), Miriam Market & Kimo Market (In Maadi). It really doesn’t have to be Dominos; it just my favorite brand and whenever I find it, I stock up on it. Any brown sugar that is soft and not granular (feels like damp sand) will do. I found the recipe tonight, going to try tomorrow, thanks so much. I see the tip about making sure you use moist brown sugar. I usually make my own up using sugar and molasses. Do you think that will be a problem with this? Thanks Becky. I sometimes use the sugar/molasses substitute too, when it’s mixed into a cake batter. However I wouldn’t recommend it for making sauces & in this case the ‘goo’ because it’s a separate entity from the cake batter. It won’t dissolve really well in the butter & will turn out gritty & the flavor just won’t be as good. It’s worth seeking out the moist one here. Happy baking. My 5 and 7 year old granddaughters made this with me. They loved the entire process and cannot wait to do it again. Instead of 9×13(don’t have an 11″ springform),I’m going to do two 8″ round.Wish me luck! Worry not my friend. I tried the two 8″ round before & turned out great! Best of luck! I couldn’t wait until I had the correct pan to make this wonderful cake. I used a smaller pan, so I had goo leftover. I also used a larger tip to pipe the goo onto the batter. All in all the cake came out very delicious. I definitely plan on making it again with the correct pan. Thanks so much for creating such a wonderful cake. Oh thank you so much Renee for coming back to give me your feedback. Nothing makes me happier than to know that someone made one of my recipes & loved it. I can’t take full credit for the recipe though, I adapted it from another blogger & just played around with its look. I’m glad u didn’t let the pan size stop you from making it. U can also make it in 2 (8-inch) pans or 1 (9X13″) baking pan with great results! I have a bigger tin so will make it again when everyone is home, I really like the idea of raisins, probably will put them into the cake batter, and now I want to sprinkle pecans onto the top as well. 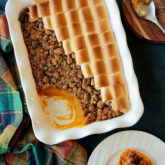 Funny that you mention pecans – my first thought when I read this recipe was “I wonder could you add finely chopped pecans to ‘the goo’?!”. It might make it too heavy and cause it to sink right to the bottom, so your idea of sprinkling them on top is perfect – thanks! Yeah I do like the idea a lot more than adding it into the goo. That way they’ll also toast and crisp up more. I sometimes find that incorporating nuts into a batter, softens them up. My second successful baking! This one turned out so good! I can’t thank you enough! You made me happy today! However, I only used one cup of powdered sugar instead of two, and it is still yummy! Way to go May!! I just love being a part of your baking adventures! Good call with cutting down the powdered sugar in the icing, as it won’t affect the cake batter itself. I always recommend that for people who are looking to cut down the sweetness. Good luck on your next baking challenge. 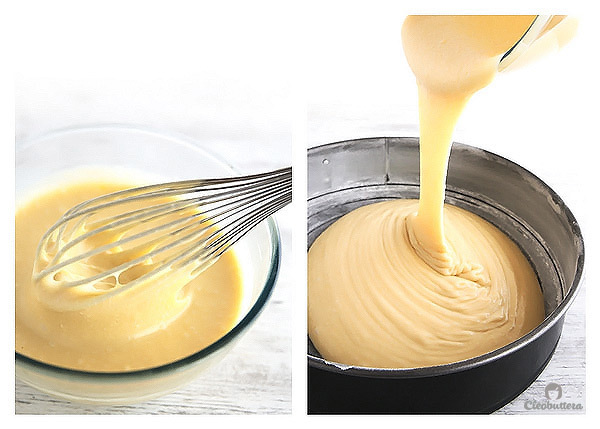 can this batter be a cake mix? if so, what kind would you recommend? Hmmm…well I’ve never tried it myself so I can’t say for sure, but I think it would work. You just need to keep in mind that the end result will be sweeter than this one because this cake batter recipe is reduced in sugar to balance out the sweetness coming from the goo. Also if you decide to use a cake mix, I recommend reducing the amount of oil/butter by half to compensate for the butter coming from the goo. 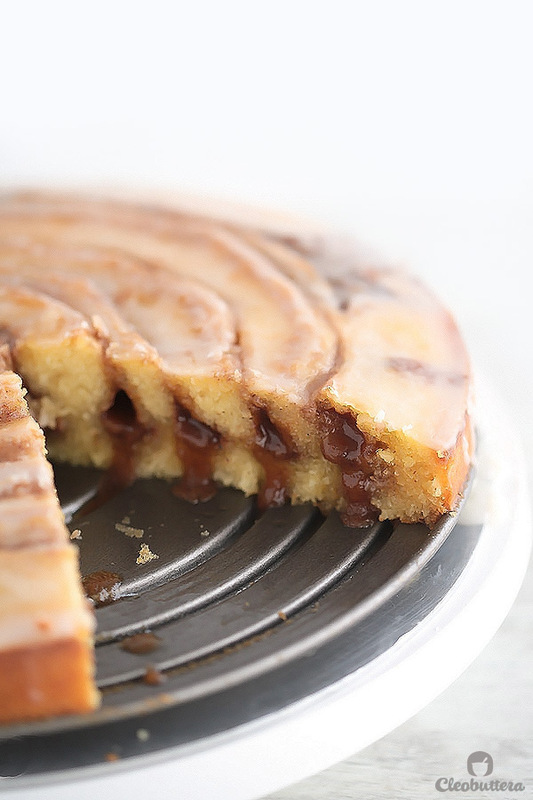 Also since the consistency of the cake mix batter is different from this one, the look of the swirl is unpredictable, so I’d go for the rectangular baking pan method which is just as delicious. Yellow or vanilla cake mixes would work the best here. Looks wonderful! Will hopefully make it soon. Do you think it will work to pour half the batter then the goo then the rest of the batter? So it’s like a goo sandwich? Thank you Heba. I love the idea! Yes I think it might just work fine. However I’d put 2/3 of the cake batter not half, then the goo, the top it with the remaining third. The goo sinks quiet a bit & I’m worried that if you only put half the batter, the goo will sink to the bottom of the pan. I’d love to know how it turns out when you do try it. Cleo, I stumbled across this recipe about five months ago and bookmarked it for a special occasion – and what cries more for cinnamon roll cake than a cold, grey, rainy Sunday? I baked the cake today and it is incredible – buttery, sweet, cinnamon goodness! I first read the troubleshooting section carefully. As some readers mentioned, I too was worried about the cake being too sweet (US recipes tend to be much sweeter than our European recipes) – so what I did was keep the glaze, because I think it makes the cake wayyy better, reduced the sugar in the cake dough itself to 1/2 cup and then added 2 tbsp of natural yoghurt to the batter with the eggs and milk to ensure moisture. This turned out fantastic. Another thing I think might have caused trouble with some readers is I do believe there is quite a bit of butter in the goo. I found the results to be better when using 3/4 cup of butter in the goo. Again, this just might be a personal preference. I was just wondering how long it takes to make this recipe. Hi Sophia:) I takes around an hour from start to finish, if not less. About 15 to 20 minutes preparation & 35 to 40 minutes baking in the oven. I made this, it was delicious. Wasn’t as pretty as yours but…it tasted good. So happy to hear that you liked it Mariam! I just made it a few days ago too but I went with the easier (Pyrex) version because I was in such a hurry. This cake is always my go-to when I don’t have time to make something complicated. I only have a 10′ springform pan… Do you think an inch would make a big difference in the outcome of the cake? It terms of looks, it will be slightly thicker so the swirl might have the tendancy to sink a bit more, but will still be delicious nevertheless & won’t affect the taste at all. I’d say go with it, however, my biggest advice for you is to make sure that you’re springform pan is leak-proof so non of the batter/goo escapes the pan while baking. If there’s a chance that it might leak, then I’d recommend either using a regular round pan or rectangular 9X13inch & serving right from it. The only thing I have changed was that I browned the melted butter. Oh no:( If you’ve used 4 tablespoons instead of teaspoons of baking powder like you said in your other comment then this is definitely the reason behind it rising too much. I’m sure it will still taste delicious because the goo didn’t go anywhere, it just sunk down. About browning the butter…this only makes the cake even yummier, but I just want to make sure that you browned the butter used for the cake and not the goo. The goo’s butter needs to be softened and not melted otherwise the it will separate, cause a huge mess and ruin the whole cake. Asma I’m so releaved that it turned out a “star” afterall:) I’m so happy that everyone liked ‘your’ cake. It’s your cake darling; you’re the one who did such an amazing job & the one who deserves the praise. Well my cake turned out a fail… The cake rised a lot.. is it from the 4 tbs of baking powder? 4 tablespoons? Dear it was supposed to be only 4 teaspoons. Way to go Habiba! I’m so happy you enjoyed one of our favorite desserts as much as we do! I have had this recipe bookmarked since long, always looking for an opportunity to give it a try. Honestly, I was a bit daunted by the cake when I had a look at it. But turns out it was pretty simple after all! My cake was not as pretty as yours, since I had a 10″ pan and not an 11″ one. But it tasted absolutely spectacular! I added a little less of the baking soda due to the smaller size of the pan. The only issue I had was that my “goo” was not as liquid as your’s. Do you know what could be the reason for that? Nonetheless, it is definitely one of the best cakes I have ever baked! So I tried baking this today and it tasted really good; however, it didn’t turn out like I thought it would! It was really fun to make though but the swirls didn’t sink in and the goo spread all over the top of the cake and I still fail to understand why 🙁 I don’t know if the cake was under cooked, even though I left it for 35 minutes, or is this how is was supposed to be because it was really soft from the inside! This is my first time making it so I didn’t think that it would be perfect since others also faced problems, but this definitely won’t be my last because I will not stop until I get it right! Aliaa I’m happy you liked that overall taste of this, but let me help you troubleshoot your issues. Let me first ask you, is it possible that you used ‘melted’ butter instead of ‘softened to room temperature’ to make the goo? What about the type of brown sugar that you used; was it soft & damp like Dominos brand? Are you sure you added the flour to the mixture? Could it be that the opening of your piping bag was really small? As far as my experience with a friend who had the same issue of the goo floating, these were some of the mistakes that she made, so I wanna make sure that you didn’t go there too. Most of the people who had some trouble with the cake had the complete opposite results; they complained that they swirl sunk too much that you could barely see the design anymore. So it’s weird that your goo floated. My advise to you, is first not to give up on this cake because when done right, it’s one of the most delicious things you could ever eat. Second, I would urge you to consider attempting the rectangular pan method instead (mentioned in the NOTES section of the recipe) which require no piping; just dropping the goo in. It’s so much easier, faster and the results are guaranteed. 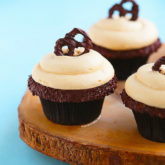 Unfortunately, I think I underestimated the difficulty level of piping the swirl and that’s why a lot of people are having trouble with getting “the look,” even though they love the taste. I promise that the next time I make this cake again, I will make the rectangular pan method and take pictures of the process to add to this post, so everyone could see both options. Yessss, I was really meticulous while doing this, I measured every single thing to the point, including the pan and piping tip size!! However, I might have let go off of 2oz of butter that I should’ve included in the cake batter so this might be why the goo didn’t sink! I’m gonna try it again tho soon and measure everything correctly and pay more attention to it while its in the oven and I’ll tell you how it turns out to be! I have made this cake several times now, and it is ALWAYS a crowd-pleaser. I’m going to turn it into cupcake-like cinnamon roll bites for a party. Thi cake literally disappears as soon as I set it out! Thanks for the fantastic recipe! Your comment has seriously made my day! Nothing makes me happier than to hear that a simple recipe from this ol’ blog had pleased a crowd and made a gathering a little extra special 🙂 So Yaaaaaaay for that! Love the little bites idea! I could imagine how could they’d turn out. LOVE this cake, and so does the rest of our family. This is a commonly requested cake. However… not the easiest but my own fault. Used a 10″ spring form instead of 11″ and the Ziploc piping method didn’t work too well for me. That being said, I am making the cake again tonight for my sister-in-law’s birthday, as per her request. I think I’ll be making it in the 9X13 method. Also, your notes, pictures, instructions are so well-written. Thank you! Looking forward to trying more of your recipes. Thank you Esther for your really nice comment. I just love getting back feedback about the recipes on the blog. Just thought I’d tell you that I finally baked this phenomenal cake today. This cake is life changing. seriously. I don’t even know where to begin. Baking this cake was probably one of the best baking decisions I’ve ever taken 😀 I can’t even thank you enough for this remarkable recipe. Everyone in my family raved about it. I couldn’t stop saying “wow” after every-single-bite and my dad who dislikes anything cinnamon (I know…), said it was amazing and went back for seconds. I have a long list of your recipes that I’m very keen to try and now that I have a bit of free time on my hands, I’m pretty sure they’ll be happening pretty soon. Hmmm…tough one Dorothy😁 Unfortunately I have no experience in gluten free baking. Sorry I couldn’t help. Please let us know if you do experiment & it turns out. I’m sure a lot of readers would love to know. Oh no Maram😱 I’d love to help you troubleshoot but I need to know if there’s anything that you did differently from the recipe instructions. Did you make any substitutions? What type of brown sugar did you use, the coarse type or soft as wet sand type? Are you sure you used soft butter in its solid state for the goo or perhaps you melted it? I’d also highly recommend checking out the troubleshooting section that’s right before the recipe. I’ve covered almost every problem that could happen & how to prevent it. Glad to hear that you liked it Ola! You could most definitely play around with the amount of glaze to suit your taste. I’d recommend cutting the amount in half or even a quarter but also reduce the milk accordingly or else it would too runny. Hi Ola! I’m happy you gave it another try. I don’t recommend cutting the sugar of the cake, as this will affect the texture of the cake. If you taste the batter itself, it’s actually not sweet. The sweetness comes from the glaze & the goo. If you like, you could cut the amount of goo by 3/4 the amount, and make 1/2 of the glaze recipe. 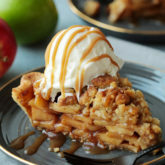 Love the idea of this, but I just finished baking it and despite following all your troubleshooting tips, it came out with a layer of melted butter on the top, and the dark cinnamon part had basically sunk to the bottom. I didn’t melt my butter, it was room temp! It is basically greasy and pretty inedible, very sad as I was meant to take it to work with me tomorrow. Will have to buy something instead. I also just read in the comments you say it’s not good the next day – you should probably mention in the recipe that you need to make it for a crowd as it doesn’t keep! Oh no Anna 😞 I’m terribly sorry to hear that. I’m really stumped at what could’ve caused that to happen. I never had an issue with the butter floating on top, so it’s very hard for me to help you troubleshoot especially that you followed the instructions. I’m so sad it didn’t turn out for you. You’re right…I should add in the instructions that it doesn’t keep well. Thank you so much for your feedback. Mariam I can’t even begin to express to you how happy your comment made me. I was so excited to see your beautiful pictures & video of this cake on your Instagram. It is absolute perfection. Thank you for restoring my faith in this cake. I know deep in my heart (and tummy) that it is a stellar dessert, but it’s just so nice to hear from someone else. I personally know a lot of people who made it and loved, but I’d still love to see everyone else satisfied with it. I think that maybe adding pictures of the easier (rectangular pan) method, could help with that. Hi there, I am so glad I found this recipe because it was heavenly!!!! I made it this morning at 7:30 for coffee breakfast and was worried we would end up with a mess instead, we were struggling to stop! Really moist and Ooey Gooey. Alert for those on a diet or calorie watchers this is a rich heavy cake so consider it a treat. As for me, I didn’t really care instead added more calories and served it with ice cream! I’m drooling again writing this lol. Thank you very much. Belle I’m not sure if you’ve noticed but this recipe has been getting a lot of mixed feedback, so I couldn’t help but get worried & have a few hot flashes whenever I receive a comment on this post lol😄 To tell you I was relieved to get your amazing comment would be an understatement! You’ve truly made my day. I’m so happy you guys loved it and hope that everyone else experiences the same success you had. So I made this cake in my 9×13pan. I baked it for around 40 min. The icing I wanted thicker so I used heavy cream. After having a slice I have been sitting in my spot for 10 min just dying out of how good it was. May I make only half the recipe !! You sure can! I do it all the time when I don’t need all that temptation around me. When I halve the recipe though, I make it in a 8X8inch Pyrex square pan & go with dolloping the goo method instead of piping a swirl. You’ll find more details about that in the ‘Notes’ section of the recipe. Hi, can i make this in two 8″×8″ square pans? I have two- one is Pyrex and the other made of aluminum. Besides my husband wants it without the glaze while I would like to have it. I don’t have 11inch and 13×9 pans. Absolutely! I make 1/2 the recipe in an 8X8″ pyrex dish all the time, so I’m sure it works really well. Hi! 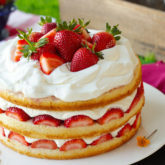 I tried making this cake yesterday, and it came out like a lot of others in the comments above: rising too much, under cooked in the center and all the goo crusting on top making it too sweet. I’ve still eaten like half of it myself because it tastes so good! XD But I imagine it tasting even better, and looking better!, if I get it right. I will try using the square pan method, but besides that, the sugar seems to be the problem. The sugar I used looks like dark brown wet sand, and it kind of sticks together if you press it. Sounds like your description to me, but it didn’t melt and stayed granulated after cooking. On the package it says “granulated sugar mixed with molasses” – is the kind you used super fine in texture? Like ground finer than normal granulated sugar? I love your blog! Thank you for the recipe! Oh maaaaan! Glad it still tasted good:) Yes! Try the pyrex (rectangular pan method) and hopefully it will turn out much better. Also the undercooked center, is probably the result of underbaking, so do exceed the suggestion baking time, if needed. You’ll want to bake it until a toothpick inserted in a cake part, comes out clean, even if it means baking longer than suggested. You’re more the welcome Ayesha. Glad you liked it! Couldn’t u still pipe the goo on 9×13 pan. Well you could, but it just won’t give the dessert this iconic round spirals that a cinnamon roll is known for…it will be rectangular. Hi! I made this at the weekend for my husbands birthday, I only halved the recipe and made a 8″ cake only but it turned out perfect, wonderfully moist. The goo didnt quite ooz out like in your picture but still truly tasty. I was wondering if this would work in cupcake form, how many would half the recipe make? So wonderful to hear that you enjoyed this recipe. I’ve never tried making it in cupcake form after reading that the original source of the recipe, Picky Palate, had a bad experience with it. She said that it created a huge mess & oozed out all over her oven. Wow! I’m so happy to hear that it worked out just fine. Thank you so much for sharing your experience; I’m sure it will be of great help to others wanting to try it as cupcakes. I know I for one, will be trying your method very soon. Sorry it didn’t turn out as expected Holy. I wish I was with you in the kitchen to know what caused the goo to not sink. I personally never had this problem, as well as many others who have tried this recipe. As you can see in the video, the goo does sink while baking in the oven & there’s no way I could’ve photoshopped that. It could be due to different ingredients in different countries, it’s really hard to tell. It really pains me to know that it didn’t work out with you & that it was a waste of ingredients. It really does. It’s comments like these that keep me up all night, because I put a tremendous amount of time & effort in recipe testing, writing a detailed recipe, shooting step by step photos & lately making videos to ensure that you get the best results possible. Please let me know if there’s anything I can help you with. Best of luck! Oh Amenah…I just love it when I get positive feedback for this one, since it seems that so many people are having issues with it, which is boggling my mind. Thank you for restoring my faith back into the recipe! I baked this cake with the kids and we had a great time preparing it and actually gulping it all down (minus a slice) on the same day 🙈🙈 so yum and fluff and gooey! I’m glad we were able to manage following your tricks and tips with butter temperature, brown sugar etc. Yasmine! You should’ve seen me jumping up and down reading your comment! I don’t know if you’ve noticed by this recipe seems to be getting the most bipolar reviews ever lol! It’s either people think it the best thing ever and a total flop. So getting such amazing feedback from you, has seriously made my day, if not week. I’m so glad you and your little helpers enjoyed making and eating this like you would believe. Thank you so much for taking the time to share your experience. Oh how nice! Welcome to Egypt! Ramadan atmosphere in Egypt amazing…I hope you enjoy it. Syrian bakeries make amazing baklavas and cheese kunafas; they’re a must try. You’re so kind…thank you so much for thinking so high of me. I definitely do not deserve all this praise. Till I figure out future plans, I hope you continue to enjoy the recipes I post here. dear Cleo, this recipe was the only that was too complicated,from the many that i tried from your site. But the same day i did the kunafa rolls, which i loved them. So there was a balance.